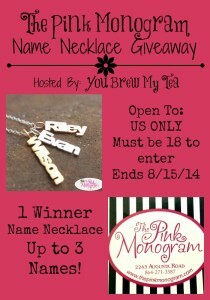 The Pink Monogram Name Necklace Giveaway | A Savings WOW! Do you love jewelry? If you do then this is the giveaway for you! The Pink Monogram Name Necklace Giveaway is a perfect way to grab a fun and unique to you necklace that is both casual and classy! This would make a terrific gift item for your teen, girlfriend, mom or wife. Easily customized in 3 colors with up to 3 names – you too can own a unique and gorgeous necklace! Check out You Brew My Tea’s review. 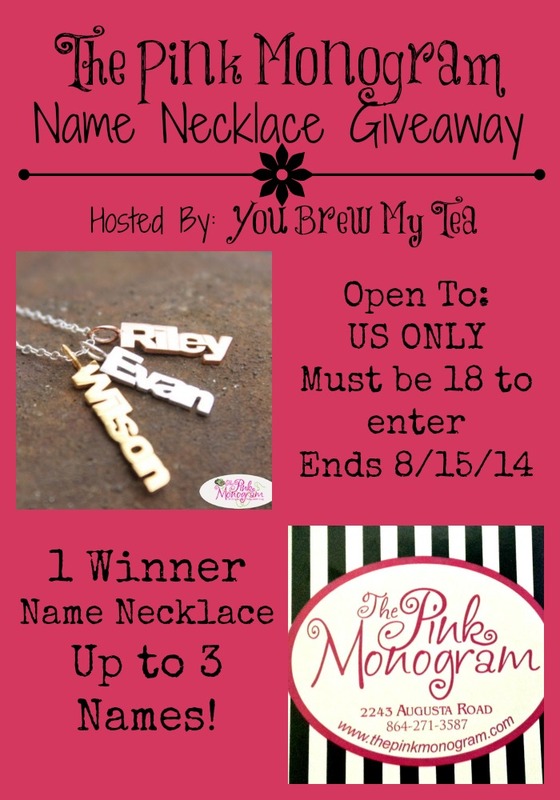 Welcome to the Pink Monogram Name Necklace Giveaway! Hosted by: You Brew My Tea and sponsored by: The Pink Monogram! Name Necklace with up to 3 names in the colors of their choice. Open to US Only. Must be 18 years or older to enter for a chance to win. All entries will be verified. Disclaimer: This blog and any participating blogs did not receive compensation for the published material in this post. No purchase is required to enter this giveaway and there is a limit of one entrant per household. Void where prohibited. Odds of winning are determined by the number of valid entries received. Winner will be chosen by Random.org and will be emailed via the email address used to enter the contest. New winner(s) will be chosen if original winner(s) has not responded within 48 hours of email notification. This blog and other participating bloggers are not responsible for shipment of prize(s). Sponsor(s) are responsible for all shipping costs related to prize(s). This giveaway is not administered, sponsored, endorsed by, or associated with Facebook, Twitter, Google, Pinterest or other social media outlet. Disclaimer is posted in accordance with the Federal Trade Commission 10 CFR, Part 255 Guides Concerning the Use of Endorsements and Testimonials in Advertising.